Join our Westalee Certified Teacher Bev Schroeder for a introductory class on the Westalee Ruler foot and Template Starter pack. Bev will teach you the proper way to set up your machine, your Sew Steady table, and explain how the to use your templates. 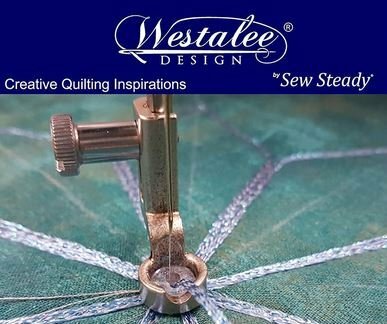 We will supply your sample quilt sandwich, you will be required to have your Sew Steady Table, Westalee Ruler Foot and Template Start Pack in order to have one of the machine seats in this class. If you are auditing you will observe the class and receive the classwork and sample quilt sandwich. In the next quarter Bev will be teaching a feather class, so don't miss out on this class if you are just starting out.